NASA says it could study distant exoplanets by using the sun as a giant gravity lens revealing (if it was Earth) islands, rivers, parks, Great Walls, freeways, cities, and so on. Imagine an alien spacecraft sitting at the gravitational focus of a distant star is revealing these details to a spellbound population. 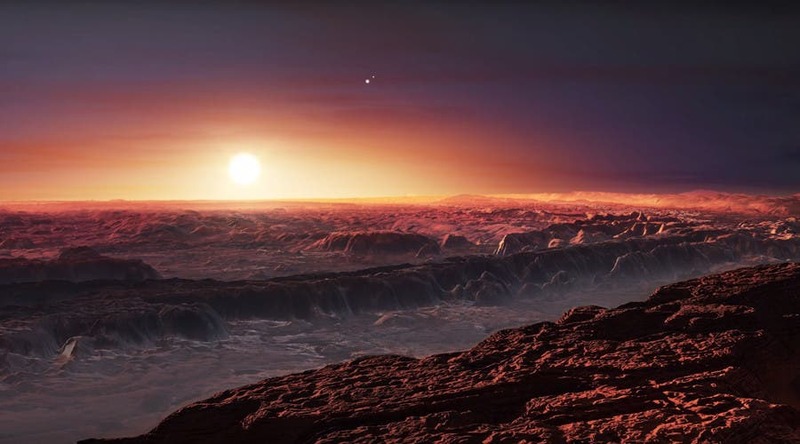 The search for a second Earth orbiting another star is one of astronomy’s greatest challenges. It’s a task that each passing day appears close to fruition. Since astronomers spotted the first exoplanet in 1988, they have confirmed more than 1,000 others through NASA's Kepler Mission. In a paper published in 1936, Einstein worked out the basic idea of what is now called gravitational lensing. Because gravity bends light, or any other kind of radiation, a large mass can act like a giant lens, bending approaching light and radio waves around it, and magnifying them. The sun can be thought of as a gravitational lens. So can any star, or galaxy, or even cluster of galaxies. An Italian space scientist, Claudio Maccone, who chairs the International Academy of Astronautics Permanent SETI Committee, proposed that gravitational lensing could be used for something even more extraordinary: searching for radio signals from alien civilizations, using the sun as a gravitational lens to make an extraordinarily sensitive radio telescope. Maccone did not invent the idea, which he calls focal, but he has studied it more deeply than anyone else. A radio telescope at a gravitational focal point of the sun would be incredibly sensitive. (Unlike an optical lens, a gravitational lens actually has many focal points that lie along a straight line, called a focal line; imagine a line running through an observer, the center of the lens, and the target.) For one particular frequency that has been proposed as a channel for interstellar communication, a telescope would amplify the signal by a factor of 1.3 quadrillion. As sensing techniques and technologies improve, astronomers are finding planets that match Earth’s vital statistics ever more closely, and the limited size of orbiting telescopes places severe restrictions on how much light and information we can glean from an Earth analogue. But the gravitational field of the sun can focus light. Place a telescope at the focal point of this giant lens and it should become possible to study a distant object in unprecedented extraordinary detail. With an amplification factor of 1.3 quadrillion, a focal telescope presents an intriguing possibility: targeting entire galaxies to scan hundreds of billions of stars at once for radio signals. Galaxies are much larger than stars, but since they are millions or billions of light years away, they can potentially be targeted as single objects. Geoffrey Landis at NASA’s John Glenn Research Center in Cleveland has analyzed the resolving power of the solar lens and worked out just how effective it could be. Despite its size, the sun only bends light by a tiny amount, with a focal point at least 550 astronomical units away –beyond the orbit of Pluto and the Kuiper Belt, which extends a mere 50 AU. “There is thus a powerful incentive to find some plausible objective in visiting the gravitational focus, as a potential intermediate step toward a future interstellar mission,” says Landis. NASA's central idea is to place a spacecraft on the opposite side of the sun from the exoplanet, but it cannot sit exactly at the focal point where the light from the exoplanet converges because any image would be drowned out by light from the sun, which would be the brightest object in the sky. Instead, the spacecraft would sit beyond the focal point where the light from the exoplanet, say in that of our closest neighbor, the Alpha Centauri star system, would form into an Einstein ring around the sun. 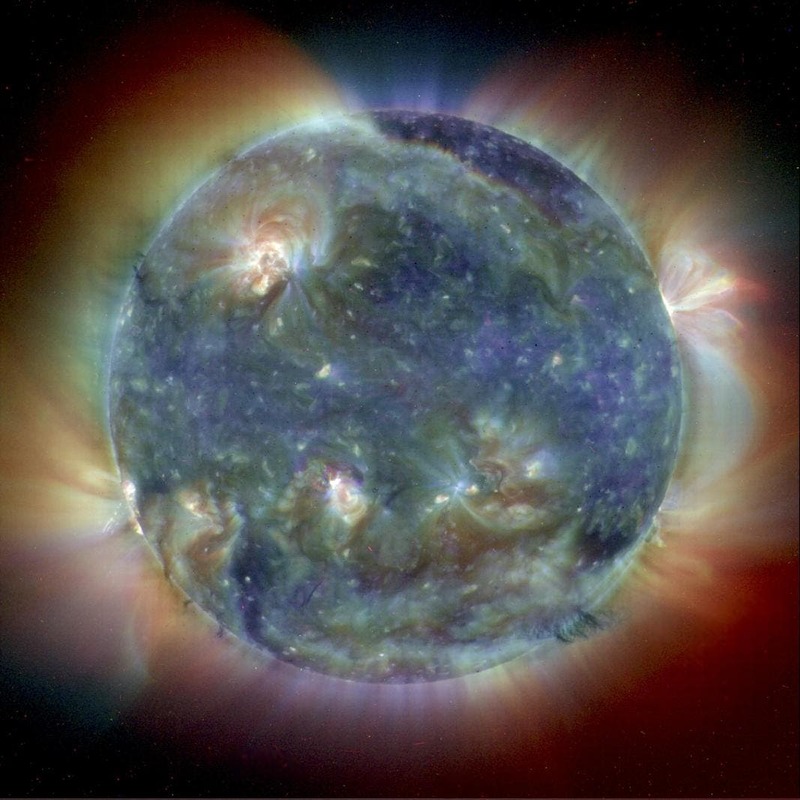 Another problem is the solar corona, the aura of plasma that surrounds the sun, which extends much further. To ensure that the Einstein ring is larger than the corona and not obscured by it, the mission would have to sit even further, at a distance of more than 2,000 AU –much further than the 550 AU that previous analyses have suggested, says Landis. 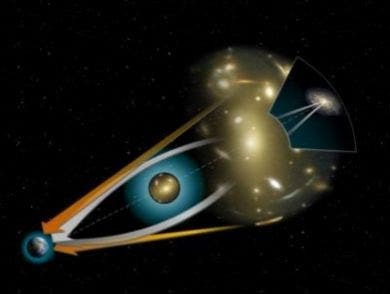 The image below shows gravitational lensing at work. A space probe at 550 AU and beyond could exploit such effects to make detailed studies of other solar systems, among numerous other scientific targets. (Martin Kornmesser & Lars Lindberg Christensen, ST-ECF). “A significant difference of the solar gravitational lens from a conventional telescope is that the gravitational lens telescope is not in any practical sense pointable,” says Landis. However, and this is its attraction, given a specific target, the focal power of the sun produces a vastly magnified field of view. To demonstrate its potential, Landis uses the hypothetical example of an exoplanet the same size as the Earth orbiting a star some 35 light years away the image at the focal plane of the sun would be 12.5 kilometers across. But, even with these challenges, Landis’s estimate is that the lens increases the intensity of light from the exoplanet by a factor of 100,000 –a significant advantage over a conventional telescope. But it can only be realized if the exoplanet light can be well separated from the light from other sources such as the sun, the corona, the parent star, and so on. All a big unknown. “Given all the difficulties, is it worth traveling out to beyond 600 AU to merely gain a factor of 100,000? Is this enough?” asked Landis. The prize would be the epic importance of finding an Earth analogue that has the potential to support life. The idea of mapping areas on this planet that are just one kilometer in size will be powerful motivation.